Phoebe Traquair was born Phoebe Anna Moss on 24 May 1852 in Kiltern, County Dublin, Ireland. Her parents were Dr William Moss and Teresa Moss (née Richardson). Phoebe was the sixth of their seven children. She studied art at the School of Design at the Royal Dublin Society between 1869 and 1872 and married the Scottish palaeontologist Ramsay Heatley Traquair on 5 June 1873. They had three children: Ramsay, Harry and Hilda. Phoebe's elder brother was William Richardson Moss, a keen art collector who owned a number of works by Dante Gabriel Rossetti who founded the Pre-Raphaelite Brotherhood, she shared her brother’s love of art, including a particular fascination with the work of Rossetti and that of William Blake. Her style and choice of subject matter remained deeply influenced by Blake and Rossetti's art and poetry throughout her life. So what has Phoebe got to do with a sleepy little village in North Nottinghamshire? St Peter’s Church in Clayworth is home to one of only two similar artworks outside of Scotland. These particular murals are the largest works of art in the East of England and were created by Phoebe Traquair in 1905. And they have to be seen to be believed... vibrant, rich colours that bring the centuries-old, grey, stone walls of the village church to life. Phoebe’s earlier Pre-Raphaelite and Arts and Crafts influences can clearly be seen in this unique, peaceful environment. I strongly recommend a visit to the church to see this work of art but put on your walking boots and take the opportunity to walk down the lane opposite the church to Otter’s Bridge, walk over the bridge, taking in the views of open-countryside then turn left and follow the canal tow-path to the next bridge. Leave the canal at this point (unless you want a good 6 mile ramble into Retford) turn left again and follow the road back to the church. Take this opportunity to call in at either the Brewer’s Arms or The Blacksmiths for a refresher. After which, continue back up the road to St Peter’s Church to complete the circuit. It won’t take long - an afternoon should do it. 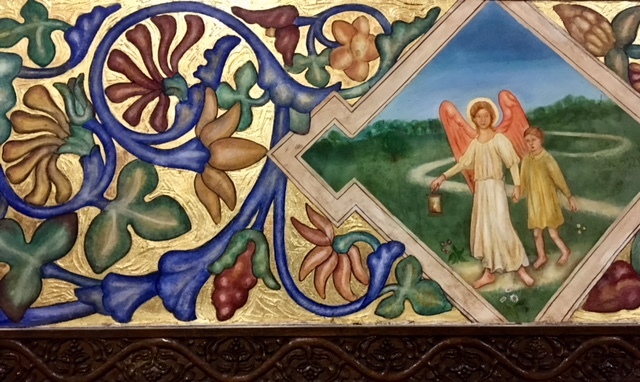 If you haven’t seen the Traquair Murals then put it on your to do list. You won’t regret it, an afternoon well spent. Our thanks to ‘North Notts Uncovered’ for this fascinating article and beautiful accompanying images. This is the first in a series of features from North Notts Uncovered about the wonderful ‘gems’ that you can discover in North Nottinghamshire.